We had a very inspiring week meeting and celebrating the heroic men who comprise the 72 living Medal of Honor Recipients. We were grateful to be invited to a weeklong series of events held each year to recognize them, both in New York and Washington DC. The MOH recipients, including our advisory board member Paul W. (Bud) Bucha, were on hand to ring the closing bell at the New York Stock Exchange. There was a tremendous outpouring of support among my former colleagues in the Wall Street community. 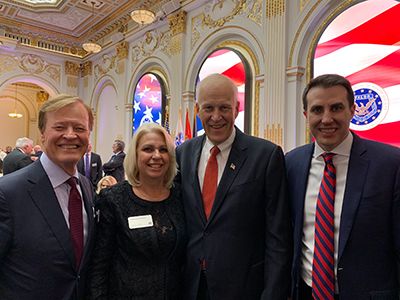 Here I am pictured at the Exchange dining room with Medal of Honor Foundation Chairman Louis R. Chênevert (and former CEO of United Technologies) and his spouse Debra (center), along with John Tuttle, the chief operating officer of the New York Stock Exchange (right). Other events in NYC and Washington drew similar expressions of gratitude. Now in our third year running, we provide complimentary VetRewards Cards to all Medal of Honor Recipients, their spouses, and surviving widows. I couldn’t be more thrilled than to once again, personally show Veterans Advantage’s appreciation for the contributions of these great Americans. Thank you to all our members who have supported and made possible this worthy program.